The ongoing saga of man vs. machine is finally coming to a close: Michael Garber has decided to part with his beloved Tiger Prowler. The Gameday Goliath is currently up for bid on eBay with a low-reserve and a Buy It Now option of only $3,000. 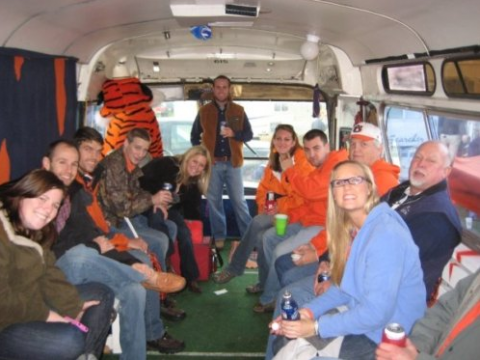 I am selling a 1971 GM fishbowl bus that I purchased in Arizona and drove to Alabama, I fixed it up and made it into a tailgating/nascar type bus that you can take to different events and have a blast in. I will include a generator to power the bus while parked, it comes fully wired, with a toilet a bar and sleeping for 3. Condition: it is what it is, I graffitied the outside with auburn themed graffiti. The paint can come off very easily and you could repaint it on your own. there are dents and dings and needs a good cleaning. Mechanically the engine fires up every time, the transmission is ok but there is a problem with the shifting mechanism that anyone with some time and money could fix I don’t have that. I have moved from Auburn and have a job now that does not allow me to use it like I want to. I am listing it with a very low reserve. the front windshield on the left has a small crack and the one on the right has a bigger crack (still driveable) It will cost you 250 dollars to move it from where it sits to a mechanic of your choice I will not pay for anything having to do with transportation that is on you. 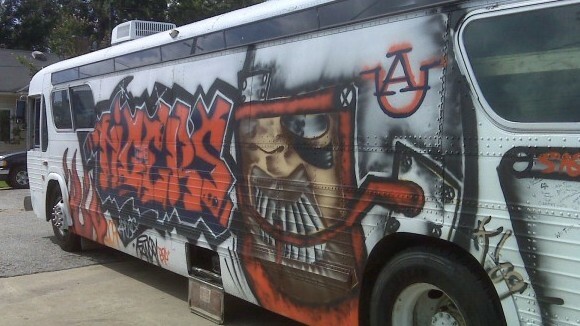 I am available on the weekends to look at the bus and I have a gentleman that can meet you to look at it in Auburn, Alabama. Features: its lined with outdoor playground grass, it has a two stroke 8V Detroit Diesel purrs like a kitten. it has 3 small beds in the back, has a very good fridge (ac, propane and 120v) it has a bar, and a campground 220v connection. It is an automatic and runs 65 mph all day long. It has a real door on the side that you can lock. It has an AC that works very well. I got a 5000 watt generator that will come with the sale. Some AU fan ought to buy this ASAP. It’s a party waiting to happen! Noticed today she still setting on Wire Road. Did she sell?